This message only to apologize to my readers: nothing worth mentioning on this blog so far. I struggle to find a "voice". Stay tuned, it will come. Saint Anne's Church, a beautiful 12th Century church built by the Crusaders. I heard Italian and Greek pilgrims sing, so I can bear witness that it's acoustics are indeed amazing. The Old City in the background, the highway linking with the North (Ramallah) in the foreground, near the Damascus Gate. You can see the Dome of the Rock on the left. 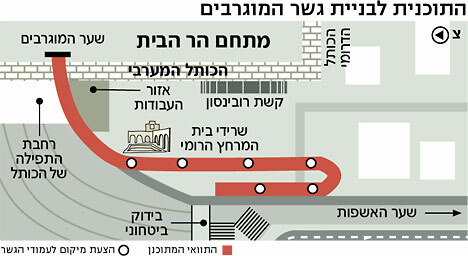 On the following map, I'm at the edge of West Jerusalem district #131 (see the history of the Musrara neighbourhood) and accross the highway is East Jerusalem. That's all for now! You can also read the following text which mentions Morasha (formerly Musrara) and Sheikh Jarrah. What's hot in the news? Following a friend's wise advice, I read the Week's End supplement of the Haaretz newspaper in English this weekend. Also, I gathered a few hints at hot topics from my cousin. So what are the hot topics? In domestic politics, the upcoming reports on the Prime Minister's corruption and the government's failures in the second Lebanon war. The Defense minister, Amir Peretz is bound to resign after the publication of the report on the war and Ehud Olmert's future is at best uncertain because of both reports. The notion of "home front" is as important as the war itself, with a lot about how the government abandoned its citizens who were under fire in the North. Benjamin Netanyahu lies in ambush, were the Prime Minister's position be vacant soon, even making a temptative move towards the center to improve his odds. times. The news concentrate on America and how America's policy meets Israel's interests, how American Jews support or do not support action against Iran. Unfortuately, I can find them on Haaretz's web site, but there were an article and an opinion on Ran Adelist's documentary film "The Shaked Spirit" which has two controversial minutes on how the Special Operations unit of the Israeli army "Sayeret Shaked", in 1967, chased and killed 250 Egyptian soldiers who were fleeing from Gaza. It sparked a diplomatic incident with Egypt. I have to go now, but remind me of returning on this subject and writing about the blood libel controversy, in the perspective of Israelis' position on public relations and anti-semitism, self-censure, etc.